Find out which of our gorgeous and smart party shoes are best suited to you so you can celebrate in style and comfort, this season. Whether you have sensitive toes or swollen feet… we’re sure we’ve got a party shoe to fit and flatter you! A heel you’ll want to keep on, all night long. With super-soft linings, a seam-free toe and underfoot cushioning. Plenty of room for swollen feet thanks to the extra depth in the sole. 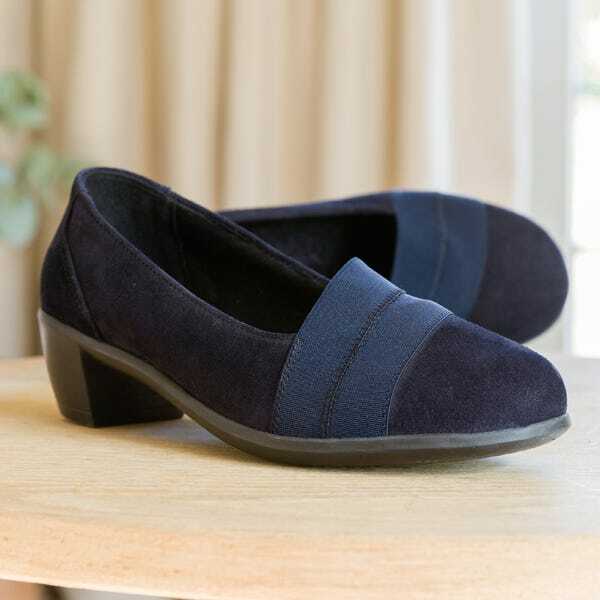 A stylish heeled court shoe with an elastic front which gently stretches for an exceptionally comfy fit, ideal if you swell across the top of your foot. A dressy shoe with a decorative button that disguises a strap that peels back to expose a gusset. Accommodates swollen feet, giving greater comfort and better fit! Add a touch of glamour to any outfit with this gorgeous shoe, which is much roomier than it looks! Ideal for sensitive toes with the seam-free front. Wear Opaque Tights or Extra Roomy Opaque Tights to complete the look. Add premium-quality tights with a smooth appearance to complete your outfit. They are wonderfully soft and smooth with an elegant silky, sheen finish. An extra roomy shoe that can make swollen feet look smart! It is a timeless classic, crafted with soft premium leathers with a cushioned footbed and shock absorbing sole to enhance comfort. This handsome shoe, could be for you. The Jones shoe combines smart styling with roomy comfort. 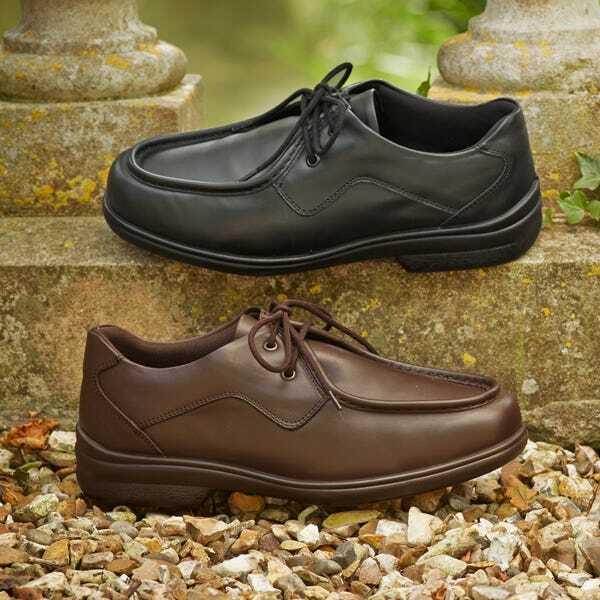 This soft leather shoe has a deep, seam-free toe area ideal for hammer toes, bunions or swelling. 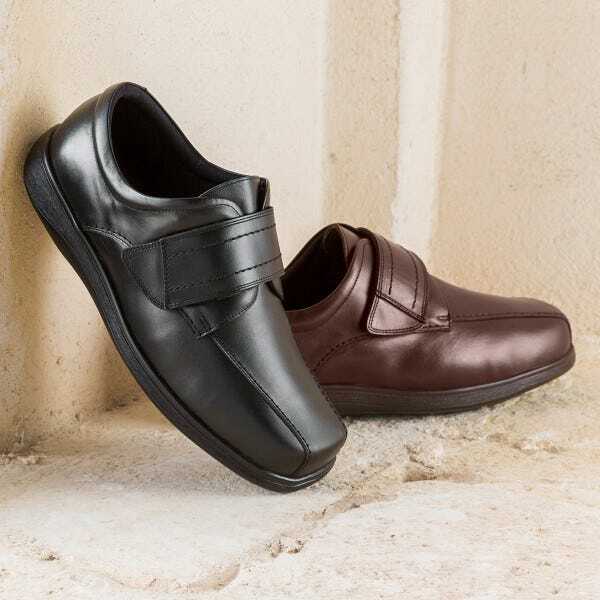 A comfy leather casual, designed to accommodate swollen feet without compromising on style. Easy to put on and very adjustable! See the Cosyfeet collection of party shoes here.